Let's face it Gamecock Girls... no gameday outfit is complete without the accessories. 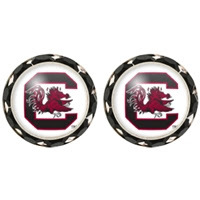 Gameday jewelry is a fun way to show your Gamecock spirit on gameday. 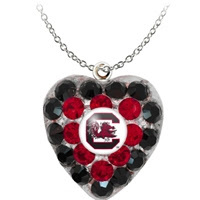 That's why we are so excited to introduce you to one of our favorite gameday jewelry lines - Fan Flirties! 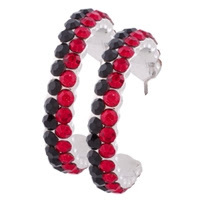 Fan Flirties is a jewelry line created and manufactured in the U.S. that offers earrings, rings, necklaces, bracelets and hair accessories in your favorite team colors and with your favorite team logos. All of their products are officially licensed and use Swarovski Elements® and/or Austrian Crystals. You will love Fan Flirties’ Gamecock designs. 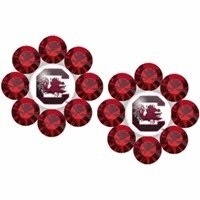 You can shop their entire South Carolina collection online on their website. Orders over $50 get FREE shipping. Their best selling style is the Daize Deco Posts earrings. 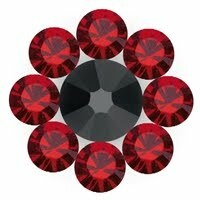 They come in a variety of garnet and black colors, and you can get them with or without the block C logo. Fan Flirties also has the cutest hair clips in a variety of designs and colors – with or without the block C logo. These are great for the gamedays when you want your hair pulled up off your neck – these will keep those flyaway hairs in place and add a pop of bling to your gameday outfit! Fan Flirties Gamecock jewelry is a great gift idea – any Gamecock Girl would love this Gamecock jewelry as a gift. 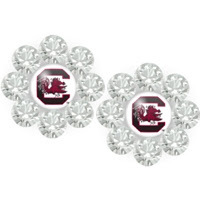 These are some of our favorite styles from the Fan Flirties’ South Carolina selection! 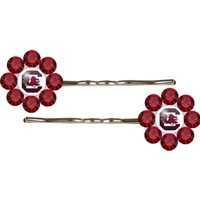 Fan Flirties has generously offered to give one very lucky Gamecock Girl reader a pair of their Large Daizie Deco Posts and a garnet and black Daize Deco ring. a Rafflecopter giveaway Deadline for all entries is tomorrow night, Thurs. Oct. 25, at midnight. We will draw a winner at random on Friday, Oct. 26, and contact the winner by email. The winner has 48 hours to email us back after we send the email or we will draw a new winner. Special thanks to Fan Flirties for sponsoring such a fabulous giveaway! !